Discover Corsica in a different way with a cruise on board one of our luxury catamarans. Want to escape? Let yourself be embarked on an extraordinary adventure where everything is possible. A cruise on the Mediterranean Sea and around Corsica, you have dreamed about it and we will grant all your wishes so that your catamaran cruise in Corsica will be as you imagine it, magical and unforgettable. 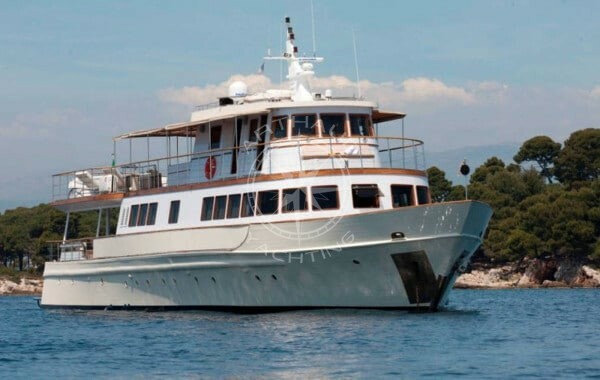 Who hasn’t already wished to go out at sea for a beautiful private cruise around Corsica? We can make this dream come true by offering you the finest in an absolutely luxourious setting. Whether you have an event to celebrate or just a desire to escape for the holidays, we will put our know-how at your service to make this stay exceptional. 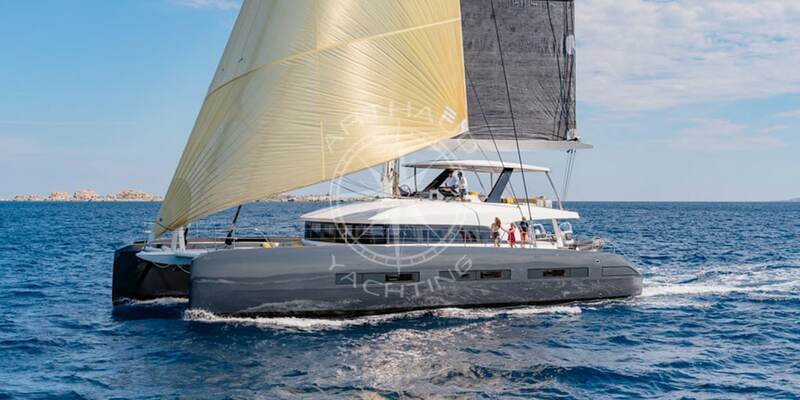 Live a VIP experience during your catamaran cruise in Corsica with Arthaud Yachting. The shimmering blue of the sea, the sound of the waves, the smell of summer and the sea air. You will rediscover these sensations by letting yourself be carried away by one of our catamarans in Corsica. Free your mind during a trip and leave with some wonderful memories. Departures to Corsica are from Cannes, Nice, Antibes or Marseille. You will have the opportunity to discover the magnificent landscapes of the French Riviera. Departures from Corsica take place in Ajaccio, Bonifacio or Calvi. Travelling to and from the most beautiful Mediterranean regions to discover or rediscover them from a different angle. The waters of the Mediterranean region will offer you superb sceneries. We will plan with you in advance the program of your cruise, stop at places of your choice, as well as activities and food menus that will meet your expectations. 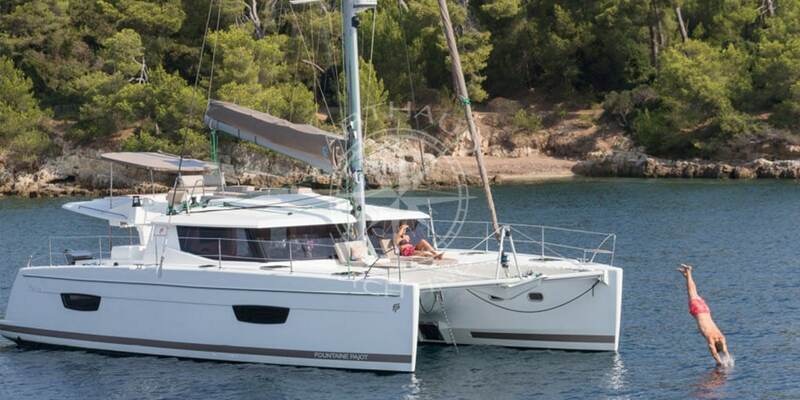 All services are customizable for a catamaran cruise in Corsica that only you can imagine. Our team will be at your service l to make your catamaran cruise in Corsica a success in every way. 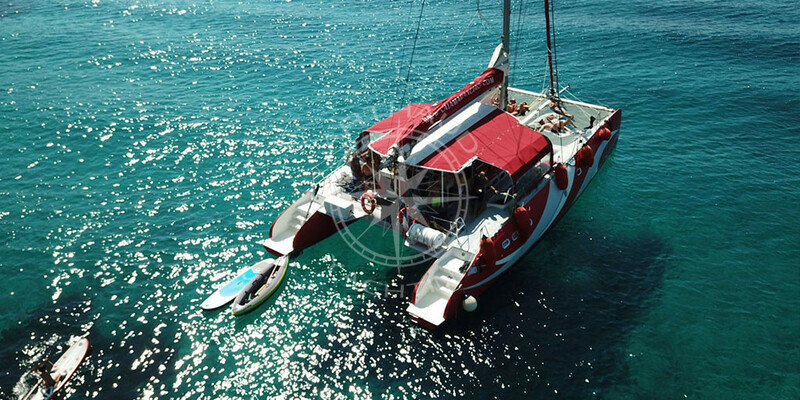 A very comfortable catamaran for dinners and lunches, naps and relaxing moments perfect for lasting memories. Corsica offers breathtaking views with its sandy white beaches, turquoise blue waters and granite reefs. You will only want to jump into the Mediterranean Sea. During the summer, the water temperature reaches 30°C, so there is no reason to hesitate. The architecture of the cities reminds us of Italy with its white houses with copper-coloured roofs. Corsica offers a multitude of culinary specialities and you will enjoy tasting and bringing back , goats cheese, local beers and other alcohols from the region. With its natural parks, it is possible to go hiking or go on bike rides or visit museums, all in the warm and gentle ambiance that Corsica has to offer. You can simply relax in the middle of the Mediterranean Sea or swim in the warm, clear water. Whatever type of holiday and catamaran cruise in Corsica you wish to experience, there is a package for you! The comfort offered by our catamarans will allow you to rest in an idyllic setting. If idleness is not for you, you have a choice among many water activities and you can try diving, water skiing, paddling, kayaking, to name only a few. Let us know what you want, we will make you live these wonderful experiences. Our team of professionals will assist you in the planning of your stay and during the course of your stay. Passionate about their job and the sea, they will make you live some unforgettable moments in the discretion and professionalism that characterises the Arthaud Yachting team. Due to their atypical architecture, catamarans are made especially for cruises. They are stable due to their two hulls on either side of the boat and the speed can be moderate or fast. 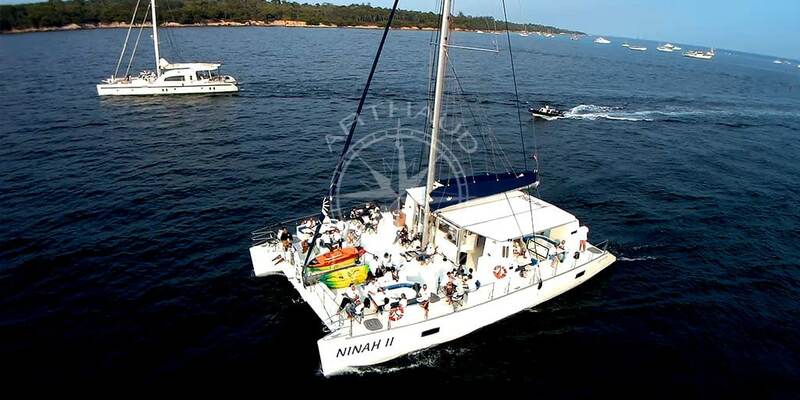 Whether the catamaran is large or small, the services remain the same: of high quality and professionalism. 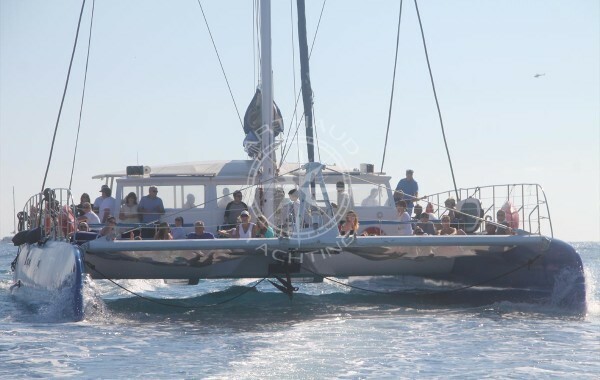 With a capacity of 4 to 25 people depending on the boat model, there is a catamaran for every need, whether you want to spend your holidays with a small or a large group. Whether this cruise in Corsica is professional or private, passengers will be equally dazzled. The setting is certainly extraordinary but being able to contemplate the view from a catamaran is even more breathtaking. Corsica has a thousand beauties in store for you. Your family will be delighted to sail out to sea, and spending time with your family will be a great way to enjoy yourself. It will be a holiday that your loved ones will remember for a long time. It is also an opportunity to celebrate a wedding anniversary with your other half and to be isolated, far from everything. Whatever the nature of your cruise, the setting of a catamaran guarantees its success. You have a seminar to organise but you do not know where you could take your employees, one thing is certain, you want to stand out. 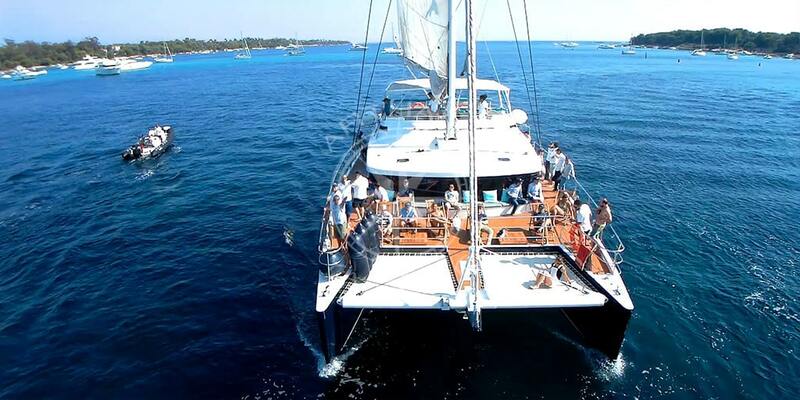 A catamaran cruise will offer an ideal and original context. This will strengthen the solidarity of the group in a pleasant moment and your employees will be more than happy about it. 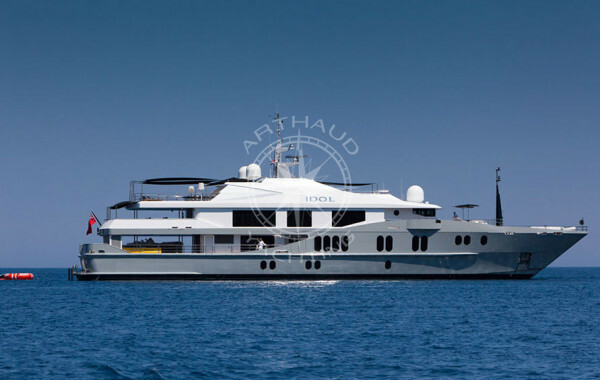 Arthaud Yachting offers you the opportunity to experience unforgettable moments. Organisers of cruises, excursions, various events for many companies and individuals, our expertise allows us to offer you a high-quality service. Responsiveness, a strong sense of service, discretion and professionalism are what we are known for. By booking a cruise with our company, you are sure to have a great time and a successful holiday. Whether you have chosen to go on a cruise for a holiday, to celebrate an occasion or for professional reasons, we will make sure that this moment is unforgettable and meets your expectations.